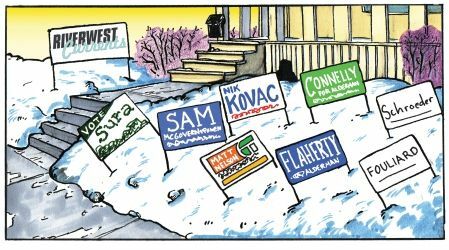 With eight candidates to choose from, voters in Milwaukee’s Third Aldermanic District are faced with a big decision when they get into the voting booth February 19. Sixth District voters have it even worse, with nine candidates on the primary ballot. In this issue of the Currents, we hope to help, if just a little. In this article, we will bring you the results of our completely unscientific straw poll of neighbors and stakeholders in the Third District, reporting who people support and why. Think of it as a conversation with a bunch of friends who are sharing their thoughts on the election with you. Commenters are arranged in alphabetical order by last name. Larry “Spike” Bandy Captain, 2900 Fratney Block Watch Club Retired Broadcaster/Journalist Supporting: Nik Kovac When I first met Nik, I was just happy to support anyone to replace D’Amato. Since then, I’ve been impressed by his commitment to knock on every door in the district and actually listen to residents’ concerns. I know he won’t ignore Rivewest like D’Amato did, and I like that he wants transparent government, rational wellplanned development and safer neighborhoods. Henry Cannon Third District/Riverwest Resident Supporting: Sam McGovern-Rowen Sam is a young energetic family man who is a long time resident of the Eastside/Third District. As a neighbor he understands the complexities of the Eastside/Third District and is the ONLY candidate that has real experience in the position while serving as the assistant to the present Alderperson for the past three years. This experience puts him head and shoulders above the other candidates, which will allow for a seamless transition of service to the Third District without all that pie-inthe-sky rhetoric.